Why use a friendly GUI when there’s cryptic shell commands out there? $ sudo iwlist eth1 scan # eth1 is my wireless card. $ sudo iwconfig eth1 essid "bestcoffee"
$ sudo dhclient eth1 # gimme an IP address plz! bound to 192.168.1.112 -- renewal in 251284 seconds. $ sudo iwconfig eth1 essid any # any is a keyword, not the name of an ESSID. $ sudo iwconfig eth1 key s:password # translates to the hex for me. Note the s: in front. That translates what I type into the hex jibberish. Then I rebuilt the postfix alias db with sudo postalias /etc/aliases, and then sent an email to [email protected] That’s when the fun began. The script is run by nobody/nogroup, so it couldn’t log to my logging directory, because I require people to be in the adm unix group. Then I created a user named runscript, and moved that | /usr/local/bin/email_reading_script.py line into a .forward file. I added adm to runscript’s unix groups. I don’t know why, but when the script runs, the shell only seems to get the primary group. So, I kept getting permission-denied errors. I finally got stuff to work when I set adm to be the primary group for my runscript user. Now everything is OK. This ate up the better part of the @#[email protected]#$ing day. Grr. If this didn’t work, I was going to install procmail and go down that route. Am using ubuntu hardy heron. Sidenote: snowball is my new computer. She is a beaut; a 600mhz Compaq Presario with 60mb of ram, and a hard drive that makes clicking sounds when anything happens. I think Clinton was still in office when she was manufactured. 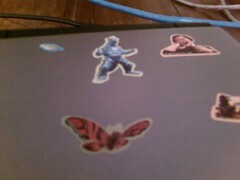 I’d like to thank my son for helping decorate her with some very cool Godzilla stickers. Installing on such an old machine meant I had to monkey a fair amount with some kernel modules, which is always a blast, and I am now much more aware of how much every program really costs in terms of CPU utilization and memory footprint. screen -t code 1 # This is where I use vi. You can use the -c option when you start screen to specify a file other than $HOME/.screenrc. So I might write a bunch of different .screenrc config files and then I can choose what ever one I want. I can already imagine a .screenrc customized for doing python work, and another one customized for writing rants, and another one for doing sysadmin work. screen -S sessionname will start a screen session and name it sessionname. screen -ls will list all the screen sessions already running. Those session names are helpful in this case. screen -r sessionname will attach a screen session that you specify. It shouldn’t be so hard to set up turbogears on ubuntu Feisty Fox. The easy_install-2.4 turbogears approach crashes when trying to install Cheetah. Then I installed the python profiler package: sudo apt-get install python-profiler. I tried installing pysqlite2 through easy_install, but that blew up, so I installed ubuntu package for pysqlite2 instead: sudo apt-get install python-pysqlite2.